How many frets, what kind of microphone and their configuration? 22 frets. Originally, they are Seymour Duncan pickups copy. Duncans but I installed it. A SH1 (59) in Chevalt and SH2 (Jazz) in neck. What are the settings (volume, tone, micro switch ...)? -2 Volumes and 2 tones independent for each microphone. Not what is most versatile. The handle is it nice? It is not flat, rather designed to fit into the palm of the hand and chords. I have big hands, it does not suit me wrong. It is a rather heavy guitar. The body is large for an electric, but there must have cavities inside because it is lighter than my Fame Forum IV. The interface is not as good as on a range of guitars of more recent design. It's hardly her strong point. Access to acute (last string) Is it easy? No, it is not very easy. Again, the conception date and it is not made for shred. Why yes, the original pickups are good clean or crunchy, but quickly becomes vague and mushy in saturation. That's why I've changed. Since the sound suits me much better. Are they suitable for your style of music? Yes, for all that is jazz, blues, rock, hard rock. Not for what is metal and funk. Ben rather fat and round (especially neck). It's a Les Paul, not a Stratocaster. Hughes & Kettner Switchblade 50 Combo TSC, Wahwah Dunlop, Whammy 4, Rocktron Hush, Rocktron Silver Dragon. What are the sounds you prefer, you hate? I do not hate the tone. It is pretty well what is in his jurisdiction. It's not a Gibson either. For 5 or 6 years. No. I found a Fame Forum IV for 799 euros. 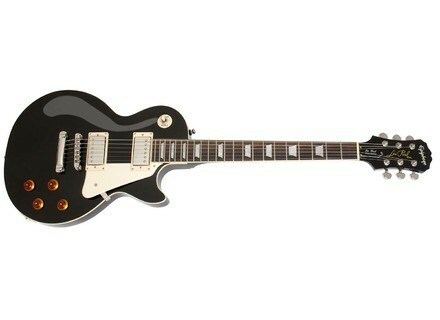 If I count my Les Paul 525 of the 200 + and dust for the 2 humbuckers, I'm almost at the same price. And in manufacturing quality, versatility (2 humbuckers and split a piezo bridge), sound, sustain, ergonomic handle, ... it easily outperforms Epiphone. dimmebag cobain's review (This content has been automatically translated from French)" Not bad at all"
except that the microphones are zero !!! or correct for a beginner! It is heavy like all Les Paul! I did not test with an amp because I have no desire to listen to the original pickups! empty but I compar with my violin and guitar sounds quite frankly its vacuum !! well if you like trains paul and you do not want to ruin you ben made pt! Just pay attention to the ears warned the microphones are not exceptional !! otherwise it is a nice guitar I do not hsiterai was up on stage when the microphones are changbr /> small BMOL is that there's more or less good series So fluke or not !! A Les Paul, with the comfort and less, the quality varnished less. Poor violin and a solidity more than average. It is very far from a Gibson. The sound is not bad, rather versatile. But still, it was better for less. I found this not particularly good for the Mtal (except stone-rock styles or green-day), but since I do not play nearly as not to pose too many problems. The sound is fat enough, not bad, but it was obviously not the grain of a Gibson. To be clear, this guitar is not bad at all, it is really worth. It is rather versatile and simply if it is used with the proper hardware. However, a standard complaint I find it quite chre in the sense o my Ibanez cot which offers 100 less than the Superior his Epiphone, and also a better finish. Obviously Gibson Epiphone is more in the mind, even though now that I have a real Gibson SG, I realize that the sound of the Epiphone years Enlightenment. I do not think I would do this choice. I would opt for Ibanez or Yamaha I think. But even when the guitar is not bad for purists seeking Gibson reasonable price.